This first week of my February challenge has gone well! My eating has been on point, and I can tell that I've lost weight - my stomach feels looser and my winter coat fits better. It's amazing what difference a few pounds can make. Breakfast was 32 oz. of water, a 6 oz. 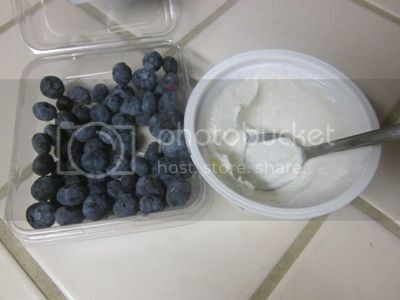 container of Fage plain 0% Greek yogurt, and some blueberries. I used to have Yoplait Light yogurts, but the Fage has more protein for the same number of calories - not to mention no artificial sweeteners. I love most of the fruity Chobani yogurts, but I'm trying to eat as many whole foods as possible, so even though the calories work out to a few more by having a yogurt and fresh fruit, I feel better about it. Plus, I like the thicker consistency of the Fage yogurt! I work out in the morning, then have 16-32 oz. of water and a Lean Cuisine or Weight Watchers meal for lunch. They're not the best choice, but they're convenient and help me prevent binges since I can have a reasonable portion of the things I crave (the chicken carbonara is pretty darn good, all things considered). 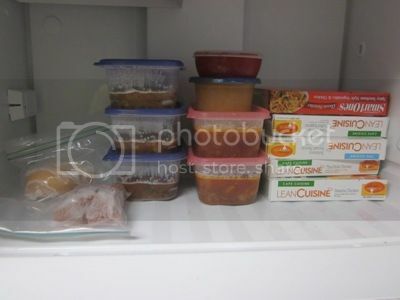 Dinner also usually comes from the freezer - a portion of a premade soup or chili that I portioned out for single-servings, or a piece of chicken. When I wake up, I move it from the freezer to the fridge so it's thawed and ready to cook/serve when I get home from work. Another 16-32 oz. of water, and I also usually make some veggies to go with my dinner to bulk it up - lately, my favorites have been broccoli, cauliflower, and Brussels sprouts. After lunch, I have a piece of fruit for a snack. 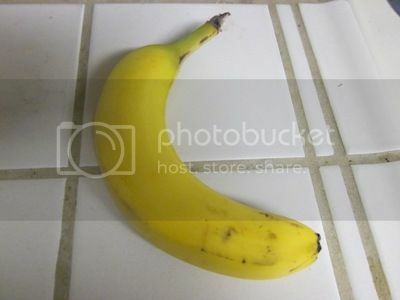 Yesterday it was a banana. Sometimes it's an apple or a pear. I also like fresh veggies - cucumber and raw mushrooms are favorites for snacking. And my late afternoon snack to get me through office hours and teaching? A single-serve packet of graham crackers (120 calories) and a single-serve container of peanut butter. Right now I have Scooby Doo crackers because Target was sold out of my usual choice, the 120 calorie pack of Teddy Grahams. These are good, but they look like dog bones, and even though they are delicious, I feel odd eating them. This was my snack every single day for nearly a year and I (a) never got bored and (b) never binged on peanut butter. Allowing myself a little of these things helps me not overdo it. I keep these at my office so there's no temptation - and if I still want it that badly ... well, to the office is a 5.5 mile bike ride, that burns quite a few calories, and I can't binge until I feel sick because there's another 5.5 miles on the bike to get me home. This set-up works well for me. Adding the fruit with breakfast and lunch are changes from when I was in Chicago. Back then, I worked mornings and exercised at night, so my dinners were bigger. Now, I work out mornings and teach at night, so I try and spread the calories out more evenly. Total is usually between 1200-1300 calories, though I am perfectly okay with upping it to 1400-1500 when I work out harder. This is what I ate yesterday; some days I mix it up, but most days are nearly identical. That kind of repetition might not work for everyone, but it's what I've found works best for me for weight loss. I like a routine! What about you? Do you usually eat the same things over and over, or do you try and change things up all the time? I enjoyed reading about your "eats." Sometimes I get helpful ideas from others, and I liked your graham cracker and peanut butter snack. Have a great weekend! I tend to eat the same things over and over and I don't get bored. My hubby, on the other hand, gets bored REALLY easily, and so it gets hard. I like sticking to my "staples" because I know what they do for me, and it has taken me a long time to figure out how to eat to mostly avoid binges. I'm right with ya, sister! Your plan sounds excellent! I eat the same things over and over again. Dinner is usually the only place where I branch out and try new things. How many calories is the fruit and yogurt? Man, I don't know if I could just slurp up my breakfast -- I LOVE bread -- I want something to crunch on and I always eat toast for BF. I am thinking, however, that I just will just need to TRY it and try it again and again until I get used to it. I can eat the same things again and again as long as they're made fresh each time. I'm one of the weirdo's who doesn't care for leftovers at all. It can be my favorite meal and I still probably won't want to reheat it. My favorite repetition lunch consists of tuna patties with zucchini chips. I make single portions fresh regularly when B is working. So, out of a week I'll eat it 4-5 times. But, then I'll pick something different for the lunches for the next week. awesome schedule. I like it a lot! Fage and Chiobani are my fav yogurts as well. I try to keep a schedule - and dinners are almost 100% planned out. i really like that idea of one serving crackers and peanut butter! thanks. I really love your plan, your eating is excellent. What a good idea about the single serve PB, I ALWAYS go for a little bit extra when I have the jar opened. I stick to the same foods, it helps me to not over indulge on the bad stuff. I get so full from the meals I cook cuz I've found my faves and just scramble them up on a week to week basis. I've had to become used to buying single serving of (insert food here) so that i can control my portions. it is more expensive but worth it. I tend to eat the same things for a week & then i change it up so that I don't get bored. You are doing a great job tracking on MFP. I eat the same things always too! My Weight Watchers leader always encourages me to switch it up, but eating the way I have found works, keeps me full and satisfied. And if you've found something you like, why switch it up?? 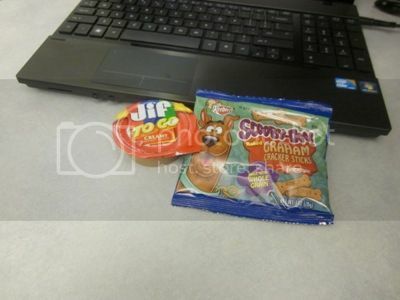 I love those Jif To Go packs. I eat those too! You know, I most recently almost quit buying peanut butter because I tend to overdo it. I think I'll buy these. I've had to buy the little individual coffee creamers that are just 1tbsp in a little plastic thing or I have been known to pour in 1/4 cup of the stuff. This looks like a really awesome snack. I'd love to have apple slices with a little peanut butter. Thanks for the idea. Omg I actually thought you were eating a cleaning product. Let me explain, in the UK Jif is what we clean our toilets with. I definitely had a WTF look on my face for a moment LOL. One thing I've eaten most says since I started my weightloss journey has been grapes. I can't get enough of them and always excited to eat them each day. Also I'm not sure if you get them in the USA but I love Kellogg's Elevenses chocolate chip bakes. Yummy! !